Thy martyr Euphemia, O Jesus, * crieth out with a loud voice: * “I love Thee, O my Bridegroom, * and, seeking Thee, I suffer; * I am crucified and buried in Thy baptism; * I suffer for Thy sake, that I may reign with Thee; * and I die for Thee, that I may live with Thee. * Accept me as an unblemished sacrifice, who offer myself to Thee with love!” * Through her supplications save Thou our souls, in that Thou art merciful. Thou didst struggle well in thy contest, * and after death dost sanctify us with streams of miracles, O most praised one. * Wherefore, we hymn thy holy repose, * having recourse to thy divine temple with faith, * that we may be delivered from spiritual afflictions, * and may draw forth the grace of miracles. Please continue to sign up for coffee fellowship/kitchen cleanup. The Altar server vestments have been ordered. Thank you for your contributions! Prayerbooks for sale, both for adults and children. Please see Stavroula or Fr. Andreas. Adult Education Classes will continue on Wednesday, following Vespers. Confession will be heard before Vespers on Wednesday, starting at 5.00 pm. September 16 is the feast day of a princess of Bohemia, part of what is now the Czech Republic. 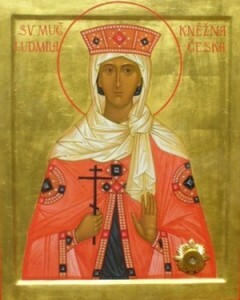 She is the Holy Martyr Ludmilla. 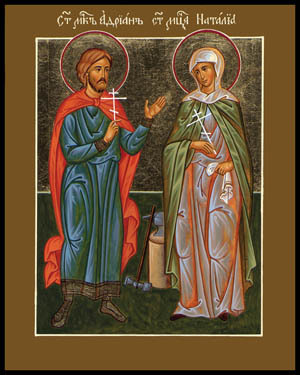 She and her husband, a Czech prince, were both baptized in about 871 by Saint Methodius, one of the two great evangelists–the other is Saint Cyril–who together are known as the Enlighteners of the Slavic Peoples. As new Christians instructed and inspired by those two great men, Ludmilla and her husband enthusiastically built the first Christian church in Bohemia, near Prague. They built other churches as well, provided for clergy to serve in them, and supported the spread of the faith among their people in every way they could. Pagan opposition was so strong that for a while the couple had to leave the country, but when they returned they continued their work. Ludmilla was widowed quite early in life; her husband was in his thirties when he died. After this, their son married a woman named Dragomira who was happy to have a royal husband, but whose Christianity was only a façade; she secretly kept her pagan beliefs and customs. Ludmilla took most of the responsibility for raising the young couple’s child, her grandson, whose name in Czech was Vatslav but who is better known as Wenceslas. She brought him up as a devout Christian, and strongly influenced his attitudes. He is the one so admiringly described in the Christmas carol as caring for the poor by taking food to them on a bitterly cold night, and being concerned for the young page who accompanied him. Dragomira was not pleased with Ludmilla’s authority over her son. When her husband died, she became regent for the young and inexperienced Wenceslas, who took the throne in 921. That was her chance, and she took it, encouraging pagan customs in the court and among the people. Her hatred of Ludmilla became so overwhelming that, even though the older woman had moved to a distant town, she wanted to destroy every vestige of her influence. She sent seasoned assassins to murder Ludmilla, and they did their deadly work. 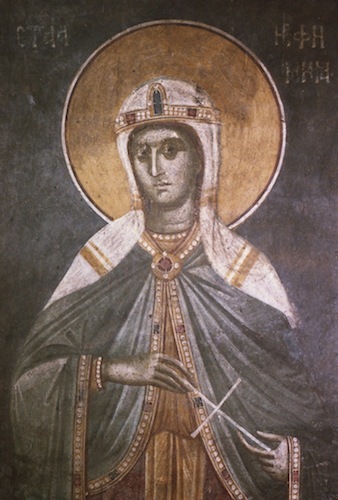 Saint Ludmilla was one who was “always being given up to death for Jesus’ sake” because the forces of paganism constantly stalked her and her family, ready to kill them. But she never wavered, and she would say with Paul, “We do not lose heart” (4:1).